This Week, Sudie Really Took Off. Sure, 35 Denton is the big local music story of the week — as well it should be. When a festival that was once regarded as North Texas' biggest returns after a self-imposed one-year hiatus, well, let's just say it gets people talking. 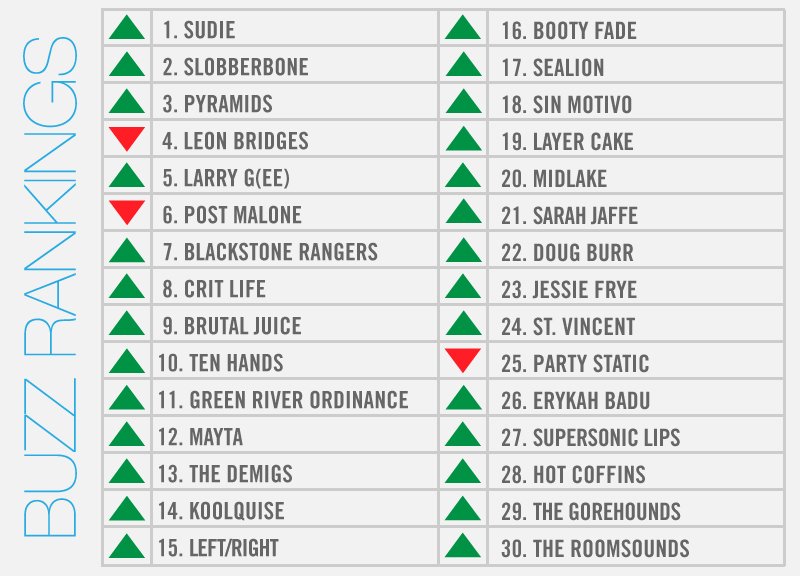 Nonetheless, it was Dallas' own Sudie that finds herself atop our weekly local music power rankings. That's because, earlier this week, the 23-year-old premiered her new “Heartattack” video via the very widely read Jezebel. In the days since its premiere, the clip has racked up over 8,000 views. In turn, this is the first time Sudie's ever appeared in the No. 1 spot. That's not to say the little festival that could wasn't a big player in the rest of this week's rankings, though. 35 Denton headliners including Slobberbone, Ten Hands and Brutal Juice each fared well for themselves this week. As did day-panel participants and performers such as Jessie Frye and Layer Cake, the latter of which is reuniting to play the fest. Like Sudie, Larry g(EE) premiered a new single and video this week. Come to think of it, Koolquise, Pyramids, Post Malone, The Demigs, Doug Burr and Hot Coffins each premiered new material this week, too. Green River Ordinance, meanwhile, was announced as performer for at the inaugural Billy Bob's Fourth of July Picnic. Elsewhere: Blackstone Rangers performs at tonight's Red Bull Sound Select Show; Mayta and SuperSonic Lips perform at this weekend's Indie Rock Latin America showcase; and The Roomsounds and The Gorehounds were among the acts that helped Three Links mark its two-year anniversary last weekend. Sudie cover image by Melanie Shafranek.